They call Matsugoro an outlaw, but he sure puts in an honest day’s work. The reformed rickshaw driver (or puller) has a dodgy past, but that is understandable given the meanness of his formative years. He is now a productive citizen, aside from some occasional drunken brawling and general rowdiness. 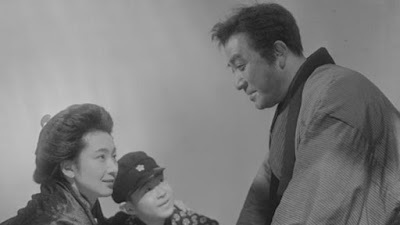 He will even file off some those rough edges when he becomes a surrogate father to a grieving young boy in Hiroshi Inagaki’s The Rickshaw Man, which was shot by accomplished cinematographer Kazuo Miyagawa and therefore logically screens during the Japan Society’s new retrospective, Kazuo Miyagawa: Japan’s Greatest Cinematographer. As the film opens, Matsugoro (Matsu-san) still likes his drink, but the community tolerates a bit of trouble-making from him, because he is a decent chap and he always tries to make things right afterward. However, his life changes drastically when he shuttles the injured Toshio Yoshioka and his alarmed mother Yoshiko to the doctor. Of course, Matsu-san refuses all compensation, so Toshio’s father, a junior government official, invites the good-hearted rogue for dinner and drinks. Everyone is charmed by Matsugoro, so when Yoshioka-san dies from a freak illness, he starts looking out for Toshio and Yoshiko. The widowed mother is particularly hopeful Matsugoro can toughen up Toshio and guide him into manhood. Despite Matsugoro’s colorful background, Rickshaw is essentially a domestic drama, which has always been one of Japanese cinema’s competitive advantages. In this case, Matsu-san’s story is particularly poignant, because no matter how much he sacrifices for mother and son, class and social distinctions dictate he can never be a full member of their family or even considered an equal. That conspicuous fact might be one reason why Rickshaw, a consistently chaste and apolitical film, was censored by the wartime Imperial government. If you need to layer more poignancy atop Rickshaw, take note Mother Yoshiko was played by stage thesp Keiko Sonoi, who perished in Hiroshima while performing there in a touring production. She is exquisitely delicate and haunting, while Tsumasaburo Bando is terrific as the gruff and gregarious Matsu-san. Rough and crude on the outside, but secretly sentimental and sensitive, he kind of hints at what it would have been like if Ken Takakura ever played Tora-san. It is also easy to see why Rickshaw was selected for the Miyagawa series, even though Inagaki’s 1958 color remake with Toshiro Mifune and Hideko Takamine is better known. He frames and superimposes some surprisingly expressionist images, at times even approaching the surreal. Perhaps most memorably, Miyagawa makes hay out of the spokes in Matsu-san’s rickshaw wheels and dazzles with some nifty transition shots. Clearly, it is a film that is ripe for rediscovery. 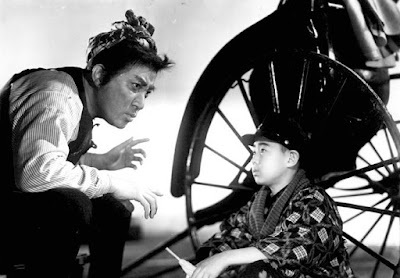 Highly recommended, The Rickshaw Man screens tonight (4/14) at the Japan Society, as part of their Miyagawa tribute.